made a few waves last year with his book Affluenza, a hefty tome that gave me months’ worth of things to look up and explore. 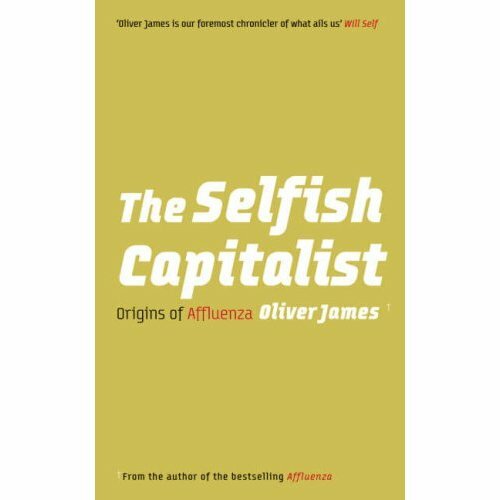 He has followed up Affluenza with , a shorter and more concise book that goes back and investigates the origins of the ‘selfish capitalism’ that he diagnosed in us last time around. The theory is that selfish capitalism is a uniquely damaging form of capitalism propagated by Reagan and Thatcher. It is characterised by four things: 1) judging the success of a company by the performance of its shares, rather than its ethics or even actual substance. 2) Privatisation. 3) Minimal regulation of financial and labour markets, favouring employers and opposing trade unions, along with taxes that benefit the rich. 4) The dogmatic assertion that the market will provide all our needs. James’ points out that this form of capitalism is found in English speaking countries, the US and the UK in particular. When compared in global studies, levels of ’emotional distress’ are highest in these countries. James’ theory is that these two facts are linked – our selfish capitalist systems are causing us distress at all levels of society. Our market driven culture is making us sick. We have affluenza. A string of studies found correlations between materialism and life satisfaction, self-doubt, television viewing habits, competitive behaviour, divorce rates, low self-esteem, boredom, eating disorders, and obesity. The trouble with this, is that all these things feed into consumer spending – you will buy new things if you’re bored, if you’re competitive, if you are unsatisfied, or need to boost your self-esteem with high-status goods. These are things that are actually good for the economy, because they make us spend more. So, we consume, and we are consumed. I find the Affluenza theory fascinating, not least because I can see so many elements of it around me in the consumer paradise of London. (Or ‘Babylondon’, as a patch on a friend’s jacket says) is a great companion book to , laying down the research and the history alongside Affluenza’s interviews and observations. It’s also a good deal shorter than the first book, so I’d actually start here if you haven’t read either yet. Next Entry Day trips to Australia, anyone?